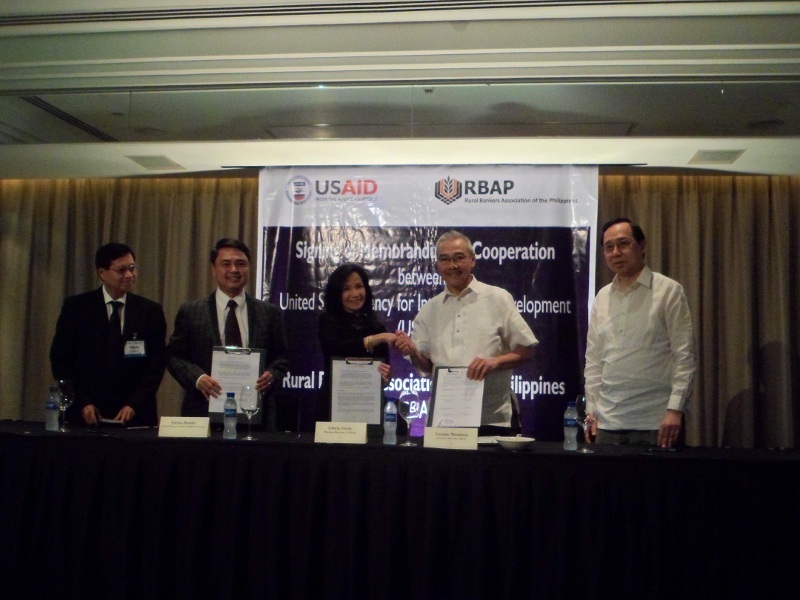 The Rural Bankers Association of the Philippines (RBAP) and the United States Agency for International Development (USAID) signed a Memorandum of Cooperation last March 31, 2014 to formalize their partnership in improving credit access through public land titling. The memorandum – signed by RBAP Executive Director Vicente R. Mendoza and USAID Mission Director Gloria D. Steele at Makati Shangri-La Hotel – is part of the US agency’s Advancing Philippine Competitiveness (COMPETE) project, which seeks to further boost growth in the country by enhancing the credit access mechanism using property rights as collateral. The USAID has been supporting residential land titling programs following the implementation of the Residential Free Patent Act, which authorizes the issuance of free patents of residential lands to Filipinos without land title. The RBAP, for its part, will assist member-rural banks to set up land titling services for free patent holders, who may also be their potential clients. Last November, the RBAP and Foundation for Economic Freedom also signed a Memorandum of Understanding for the dissemination of information on credit access and land titling among rural banks, their clients, and local government units. Tiaong Rural Bank, Inc. (TRBI) celebrated its sixth decade in the business with a grand appreciation banquet on March 28, 2014 at the Anfa Royale Hotel in Lipa City, Batangas. The momentous event, attended by the bank’s Board of Directors and officers, business partners and valued clients, was highlighted by an audio visual presentation on TRBI’s humble beginnings and a glimpse of its future endeavors. To express gratitude for their continuous support, the bank also gave recognition to its top-performing employees and loyal clients. Raffle prizes and souvenirs were also given away throughout the celebration. The memorable evening was capped off by a heartfelt message of thanks from TRBI Chairman and President, Dr. Gerardo M. Castillo. 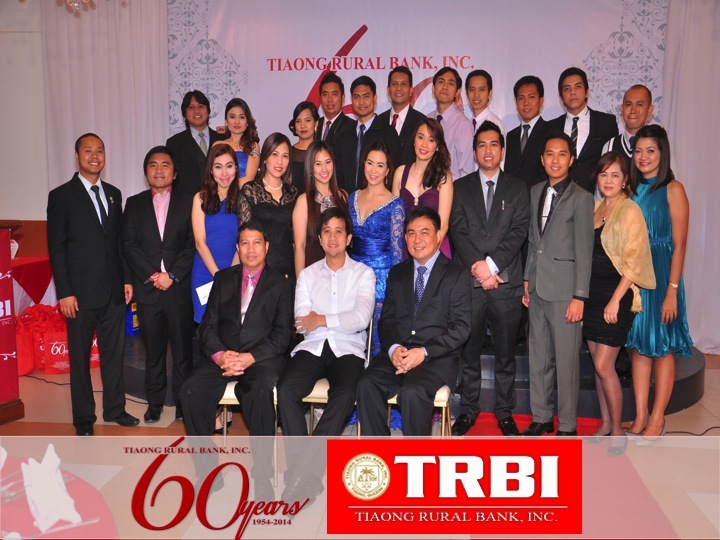 Founded in 1954, TRBI now has eight branches strategically located in Cavite, Laguna, Batangas and Quezon. 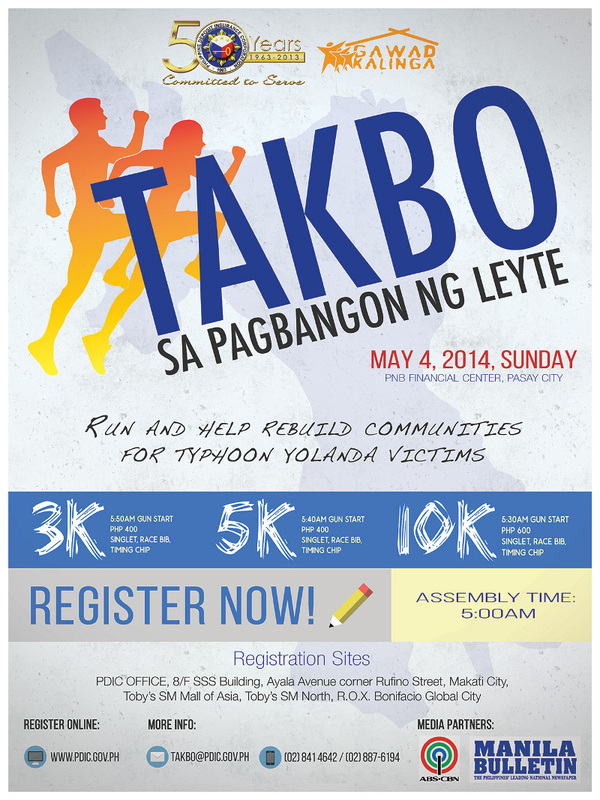 The Philippine Deposit Insurance Corporation (PDIC) will be having their benefit run,“Takbo Sa Pagbangon ng Leyte,” on May 4, 2014 at the PNB Financial Center along Pres. Diosdado Macapagal Boulevard, Pasay City. A copy of the registration from is available for download on the PDIC website: www.pdic.gov.ph. and on the RBAP website. MANILA, Philippines – In 2011, Philippine rural banks processed over P4.9 billion (roughly $116 million) worth of banking transactions which were enabled by mobile banking. In fact, the former head of the Microentrepreneurs Access to Banking Services (MABS) program John V. Owens said a 58-percent increase in the volume of transactions through mobile banking has been noted in the first four months of 2012. Since mobile banking or access to banking services through the mobile phone technology was introduced in 2006, a total of P16 billion (approximately $363 million) had been processed. Involved in the entire process were 73 rural banks through their 1,168 branches and other banking offices. In his presentation at the 59th convention of the Rural Bankers Association of the Philippines (RBAP), Owens noted that the rural bankers made good their partnership with the two leading telecommunications companies – Globe Telecom and Smart Communications – to facilitate easier use of mobile money for greater access to banking services. “Rural banks are fortunate to live in a country with two very active and supportive mobile money platforms and a very proactive and supportive regulatory environment. I highly recommend that all rural banks take advantage of these two platforms to better connect with new and existing clients and customers,” Owens said. Globe and Smart have over 85 million subscribers and this number is growing whereas rural banks serve only six million clients. There are now 10 million Filipinos that have registered to the two mobile money platforms. Article written by Ted P. Torres. The Philippine Deposit Insurance Corporation (PDIC) has expressed support for the Senate and House bills that aim to amend the Rural Banking Act, allowing foreign ownership of rural banks. According to PDIC President Valentin A. Araneta, the broadening of sources of capital and banking technology implied by the proposed amendments could only serve to increase the range of options for rural banks to strengthen their financial and organizational capabilities. A law allowing foreign ownership of rural banks will further enhance the initiatives to strengthen the banking sector. In August this year, the Bangko Sentral ng Pilipinas (BSP) and the PDIC signed the memorandum of agreement on the Strengthening Program for Rural Banks Plus (SPRB Plus), a program that expanded the Strengthening for Rural Banks. SPRB Plus includes thrift banks, commercial banks, and non-bank corporations as among the strategic third party investors (STPIs) entitled to incentives under the program. Under the SPRB Plus Program, certain incentives including branch licenses will be provided by the BSP and PDIC can grant financial assistance to the acquiring thrift and rural banks. This is to broaden STPI participation under the Program and promote successful banking partnerships. The SPRB Plus aims to strengthen the thrift and rural banking industry to improve the delivery of financial services that will help sustain countryside development. The Program will be available until December 31, 2013. (Please click the attached weblink http://www.pdic.gov.ph/index.php?nid1=8&nid2=1&nid=100154 to go directly to the PDIC website. On behalf of the Microfinance Council of the Philippines , the Rural Bankers Association of the Philippines is pleased to announce the start of the 2012 Citi Micro-entrepreneur of the Year Awards Program. The Citi Microentrepreneur of the Year (MOTY) Awards is a nationwide search for outstanding microentrepreneurs in the Philippines. Now on its tenth year, the awards program has been successful in increasing awareness for microfinance and providing incentives to microentrepreneurs in the country. Funded by Citi Foundation, the Citi MOTY Awards was launched in 2002 as part of the celebrations for Citi’s 100th year in the Philippines. The award program is a partnership among the Bangko Sentral ng Pilipinas (BSP), Citi Philippines, and the Microfinance Council of the Philippines, Inc. (MCPI). To provide incentives for micro entrepreneurs to improve their businesses, products, services, technologies, and accelerate income‐generating activities. To generate public awareness and build support for microfinance and microenterprise development as a tool for employment generation & poverty reduction. In 2012, the program will recognize one (1) Citi Microentrepreneur of the Year and three (3) regional awardees from the country’s three major island groups of Luzon, Visayas, and Mindanao. This is open to microenterprises with asset size of PHP300,000 to PHP3 million. Two special awards will be given — one Special Enterprise Award for microenterprises with asset size less than PHP300,000; and a Special Award for Innovation for enterprises that successfully adopted technological innovations in its business. The Loan/Account Officers will accomplish the nomination forms with the assistance of the Microentrepreneur-nominee. The accomplished forms will be assisted by loan officers to the top management of the MFI. The top management of the MFI will conduct the initial screening of the potential awardees. For the Citi Micro entrepreneur of the Year, each MFI will submit only four nominations, which the MFI considers most outstanding from among its clients. The MFI will rank the nominations from 1 to 4 using the MFI Monitoring Form. For the Special Enterprise Award and the Special Award for Innovation, each MFI will submit three nominations for each special award. The MFI will rank the nominations from 1 to 3, using the MFI Monitoring Forum. The nomination forms, write-ups, photos and the MFI Monitoring Form are to be submitted to the network or association (such as RBAP) where the MFI is a member. MFIs may also choose to submit nomination forms directly to the Secretariat of the Microfinance Council of the Philippines, Inc. MFIs that do not belong to any network or association may also submit nomination forms directly to MCPI. The Valiant Bank of Iloilo was awarded for the seventh straight year the Certificate of Transparency award from the yearly MIX Market Global merit recognition awards of the Consultative Group to Assist the Poor, a press release from the firm said. Bank president, Ian Eric Pama, received the award for the company during the 2012 15th Anniversary of the RBAP-MABS program of the Rural Bankers Association of the Philippines and the United States Agency for International Development held at the Hyatt Hotel in Manila recently. In 2006, Valiant Bank bested 230 MFI’s from 63 countries by being the 1st Philippine Bank to receive the prestigious CGAP global award, the press release said. President Aquino on Monday signed into law two measures aimed at strengthening the country’s anti-money laundering campaign by promoting openness in financial transactions, Malacañang said on Monday. “In a major step forward in enhancing transparency and accountability, the President has signed two bills into law, namely, ‘An Act To Further Strengthen The Anti-Money Laundering Law’ and ‘The Terrorism Financing Prevention And Suppression Act of 2012,’” Presidential Spokesman Edwin Lacierda said in a statement. He added that the measures affirm the Aquino administration’s commitment to accountability and transparency, and qualify as two of three reforms needed for the Philippines’s with the international standards set by the Financial Action Task Force. Manila Times: (White) knights to the rescue? Help is on the way. Amid the desolate depths of despair that commonly embraces the unfortunate victims of cash-strapped financial institutions like banks going under, a program has been placed to pave the way for the potential onrush of corporate saviors before further damage can be done in the entire banking industry. Under the milestone initiative called the Strengthening Program for Rural Banks Plus (SPRB Plus), even non-rural banks can come in and invest in financially troubled rural banks, including strong and well-managed thrift banks and commercial banks. In return, the Bangko Sentral ng Pilipinas (BSP) offers various incentive packages to potential white knights in a bid to end costly failures in the rural banking sector. The incentives being offered include loans to help address capital shortfalls and to help meet needed resources to improve operations; temporary regulatory relief such as on capitalization requirements; and easier requirements for branching for commercial, thrift and rural banks. Loans to be extended to strategic third-party investors (STPIs) will be sourced from the P5-billion fund, which the BSP and the Philippine Deposit Insurance Corp. (PDIC) have put up through their equal contributions. Rural banks with risk-based capital adequacy ratio of less than 10 percent and willing to merge or consolidate with STPIs are qualified under the SPRB. The financial assistance under the incentive program is a combination of preferred shares and direct loan to reinforce the bank’s capital. The preferred shares shall be convertible amounting to 50 percent of the capital adequacy of the bank being acquired. The direct loan shall be granted on a concessional rate payable in 10 years. It is hoped that a government’s stake in a distressed bank, through the preferred shares, will give potential white knights a sense of security. SPRB Plus will be in effect until the end of 2013. As of March 2012, the PDIC has received 17 applications for the current SPRB involving 31 rural banks. Four of these applications have been approved by the PDIC and two are in the process. Under the previous version of the SPRB, only financially sound rural banks were offered incentives to acquire a distressed rural bank old version. The old version of the SPRB was scheduled to expire this August. The expected entry of investor-banks into the rural banking industry is expected not only to save a lot of cash-strapped rural banks, but also improve the quality of corporate governance and management within the industry, according to regulators. The BSP said that problematic rural banks are the exception rather than the rule, as the country’s entire banking system remains generally sound and stable. When a bank in Tangkawayan was placed under receivership by the BSP, a new wave of panic and uncertainty among rural bank clients was created. But this should not be the case. In truth, this is just part of the consolidation process under the SPRB Plus that seeks to encourage mergers, consolidations and acquisitions in the rural banking industry through the grant of financial assistance and regulatory support facility. The bank in Tangkawayan is just one out of the 23 rural banks operating in Quezon province and one out of some 500 rural banks operating in the Philippines. RBAP member-banks remain financially sound and liquid. What occurred with the New Rural Bank of Tagkawayan Inc. is just part of the maturation and development process as we move toward a stronger industry more attuned to the times and much better suited to address the needs of our clientele. The entry of white knights also alleviates the government of financial burden of rescuing an insolvent bank. Upon closure of a bank, government-owned PDIC assumes the bank’s remaining assets and shoulders payment of all its liabilities, including deposits from the public. Naturally, saving a troubled bank is preferred over closing it down. A more reasonable way to save banks in trouble is for them to come into strategic alliances with stronger ones, address their capital problem, and allow significant corporate reconstruction. This is how financial regulators from other parts of the globe address this issue. Rural banks comprise the bigger chunk of the total number of banks in the system at about 86 percent. Their contribution to countryside development should be supported by encouraging them to merge and consolidate to attain economies of scale, achieve higher lending capacities and improve the quality of their banking services, particularly in their niche markets. The industry is one with the regulators in envisioning that the improved program will ensure the efficiency and effectiveness of rural banks in mobilizing savings and investments toward a robust economy, particularly in the countryside. The rural banking industry has once again defied naysayers with the successful staging of the 59th RBAP Annual National Convention – a celebration of the industry’s yearly milestones, at the idyllic island resort of Boracay last May 24-25. Delegates, guests and sponsors, numbering more than 500, exchanged pleasantries with their colleagues and listened attentively to the speakers who delivered motivating speeches on the thriving and evolving rural banking industry. This year’s recently concluded convention might as well be called innovative and forward looking as some chosen speakers representing respected international agencies, presented timely research such as better than expected financial performance of rural banks despite increased competition from non-RBs and, methods on how to attract potential investors. Other speakers also highlighted the breakthroughs in mobile banking, the growing number of RBs offering microfinance to rural folks and, pioneering technology that RBs can utilize in the future to further strengthen its position as a catalyst for rural development. To know more about the varied topics discussed during the convention, we encourage all, even those who missed the event, to download the PowerPoint presentations from RBAP’s Slideshare account. Congratulations to all those who made it possible for the spectacular staging of the 59th annual convention of RBAP. MANILA, Philippines – Foreign venture capitalists are holding talks with Philippine rural banks and life insurance firms in another positive sign of strong optimism in the local economy. 1st Valley Bank President and chief executive officer Nicolas Lim admitted that the rural bank has been entertaining talks with a foreign venture fund interested in investing in the bank. At the same time, Lim revealed that the bank has also applied for a thrift bank license with the Bangko Sentral ng Pilipinas (BSP). 1st Valley Bank is a rural bank based in Baroy, Lanao del Norte and servicing various areas in Mindanao, specifically the provinces of Lanao del Norte, Lanao del Sur, Misamis Occidental, Misamis Oriental, Bukidnon, Zamboanga del Norte, Zamboanga del Sur and Zamboanga Sibugay. At present, the bank has 22 branches, five extension offices and three financial solution centers in Regions 9 and 10. “That is true. We are talking with a foreign entity and that we have applied for a thrift bank license,” Lim said, adding that three more rural banks are in a similar situation. While Philippine regulations disallow foreign equity into rural banks, 1st Valley is left with two options. First, it should first get the thrift bank license before closing any equity deals with foreign venture capitalists. Or, the foreign investor can form a domestic company or joint venture, which would then invest in the rural bank. The situation has similarities with the life insurance industry, which allowed the practice of bancassurance (or cross selling) as long as the expanded commercial bank acquires at least five percent equity into the life insurer. As an alternative, banks and life insurers formed joint venture companies which, in turn, would engage in bancassurance, or the selling of insurance policies within the bank’s branch network, as well as dip into the bank’s client base. Meanwhile, Philippine Prudential Life Insurance Co. Inc. is being courted by foreign venture capital for an equity investment deal. While admitting that they are in talks, Phil. Prudential Life president and chief operating officer George D. Mercado refused to reveal details as the insurer was bound by a confidentiality agreement. But Mercado said new equity would mean additional capital that would allow the insurer to meet new capital requirements by regulators. “We have been around for over 49 years, with over 1.8 million policyholders and an P83-billion business-in-force. Last year, Phil. Prudential Life recorded corporate history with over P1-billion in total premiums,” the chief executive said. Recently, Incofin Investment Management and responsibility Social Investments acquired 40 percent of Encash, a automated teller machine (ATM) provider focused mainly in thrift and rural banks. Leapfrog Investment, a global venture capital fund, has been moving around the country with a $20-million package for investments in microfinance-oriented financial institutions. Venture capital from Singapore is likewise in the prowl for investment opportunities in Southeast Asia. With assets under management of over $10 billion at the start of the 21st century, Malaysia, Vietnam and Indonesia have reported taken a considerable share of venture capital attention. Venture capital from Europe and the Middle East are likewise looking at South and Southeast Asia for equity investments, with bias in later-stage operations over start-ups. It is likewise keenly observing the merger and acquisition (M&A) market in China and Japan. Investors from the Middle East, meanwhile, seem to have a bias for Islamic banking-compliant entities. The scorching heat that enveloped the metropolis may have deterred some from venturing out last April 24, but representatives from both RBAP and the Philippine Crop Insurance Corporation were not at all troubled as they met and sealed their partnership in support of the government’s effort to uplift the lives of small farmers and fisherfolk through the Food Staples Sufficiency Program (FSSP). Witnessed by none other than Department of Agriculture Secretary Proceso Alcala and Usec Berna Romulo Puyat, President Ian Pama and Executive Director Vicente Mendoza signed the Memorandum of Understanding with counterparts Atty. Jovy Bernabe and Mr. Norman Cajucom of the PCIC at the NIA premises in Quezon City. A timely agreement, the FSSP is the government’s answer in helping the farming community cope with the increasing effects of climate change on crop output. As a signatory, RBAP is given the task of “formulating policies that recognize the importance of agricultural insurance as a mechanism in helping manage risks in agricultural lending and investments.” Another responsibility is for the association to “facilitate cooperation between member banks and PCIC regional offices”, especially when the insurance programs are being implemented. One of the worthy undertakings of this MOU is the planned Road show/Workshop in select areas in all the three main island groups. A joint sectoral undertaking, topics that will be discussed are on Agri-Lending and Agri-insurance for farming and fishing communities. For more information on the various crop and livestock insurance schemes, just go to our Slideshare account, or you may also download the attachments below. You may also click the links below to view the contact details of the PCIC Regional Offices.